You're still here? You already learned the basics of the Symfony CMF and you want to learn more and more? Then you can read this chapter! This chapter will walk you quickly through some other CMF bundles. Most of the other bundles are integrations of great existing bundles like the KnpMenuBundle or SonataAdminBundle. The CMF recommends to rely on the LuneticsLocaleBundle to handle requests to / on your website. This bundle provides the tools to select the best locale for the user based on various criteria. When you configure lunetics_locale, it is recommended to use a parameter for the locales, as you need to configure the locales for other bundles (e.g. the CoreBundle) too. As you can see, the menu is rendered by the knp_menu_render function. This seems a bit a strange, we are talking about the CmfMenuBundle and not the KnpMenuBundle, aren't we? That's correct, but the CmfMenuBundle is just a tiny layer on top of the KnpMenuBundle. Normally, the argument of knp_menu_render() is the menu name to render, but when using the CmfMenuBundle, it's a node name. 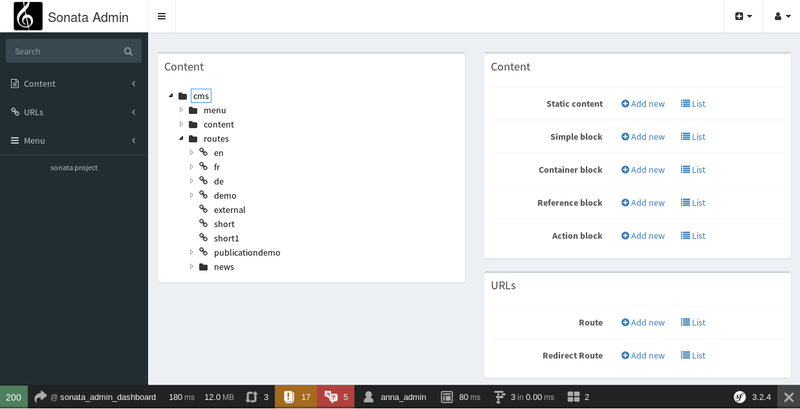 In this case, the menu contains all items implementing the NodeInterface inside the /cms/menu/main path (since the basepath in the CMF Sandbox is /cms/menu). Re-run the fixtures loading command and then refresh the web site. The menu entry is added at the bottom of the menu! These blocks can be edited and used on their own. These blocks are provided by the BlockBundle, which is a tiny layer on top of the SonataBlockBundle. It provides the ability to store the blocks using PHPCR and it adds some commonly used blocks. There is also a SeoBundle. This bundle is build on top of the SonataSeoBundle. It provides a way to extract SEO information from a document and to make SEO information editable using an admin. title: "%%content_title%% | CMF Sandbox"
When you visit the new website, you can see nice titles for each page! The default title is configured under the sonata_seo extension, while the standard title is configured under the cmf_seo extension. The title is just one feature of the SeoBundle, it can extract and process a lot more SEO information. We have explained you that the CMF is based on a database, in order to make it editable by editor users without changing the code. But we haven't told you yet how an editor is able to maintain the website. Now it's time to reveal how to do that: Using the SonataAdminBundle. The CmfSonataPhpcrAdminIntegrationBundle provides admin classes for all documents provided by the core CMF bundles. As you can see on the left, the admin uses the TreeBrowserBundle to display a live admin tree, where the admin can click on the nodes to edit, remove or move them. See the Sonata Admin Integration Documentation to learn about the configuration options for each admin. Instead of binding controllers to routes, the routes are bound to content objects. The Symfony CMF took care not to reinvent the wheel. That resulted in a lot of bundles integrating commonly known Symfony bundles. I can't tell you more about the architecture and bundles of the Symfony CMF, but there is much much more to explore. Take a look at the bundles and get started with your first project using the Symfony CMF!